Shanta comes from a village in Kapilvastu District in the Western Region of Nepal, where her father is a subsistence farmer. Shanta is the youngest of four children and the third daughter. As a child, she contracted polio, which left her physically disabled. Consequently, she walks with crutches. Shanta says her father did not care about her education or offer any encouragement. Although her parents brought her to a hospital in Kathmandu, they could not afford the treatment. Fortunately, they inquired about organizations that help disabled children. 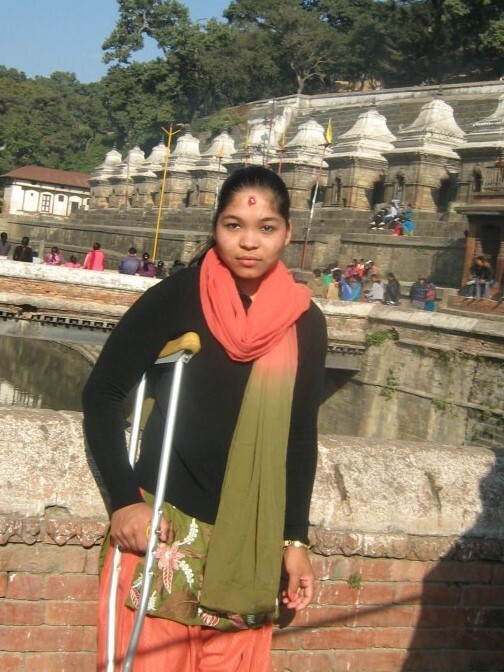 At age 12, Shanta became a resident at large home for disabled children. She says that living with other disabled students made her feel stronger and more hopeful. There she also met Amrit Pudasaine, an educator and social worker who became an important mentor for her and several other BMKF scholars. When Amrit left the large organization to found DHC New Life Center, Shanta and a dozen other disabled students followed him. Shanta’s goal is to complete a business studies degree and become a bank manager. That way, she says, she will be able to support and empower other people with disabilities.